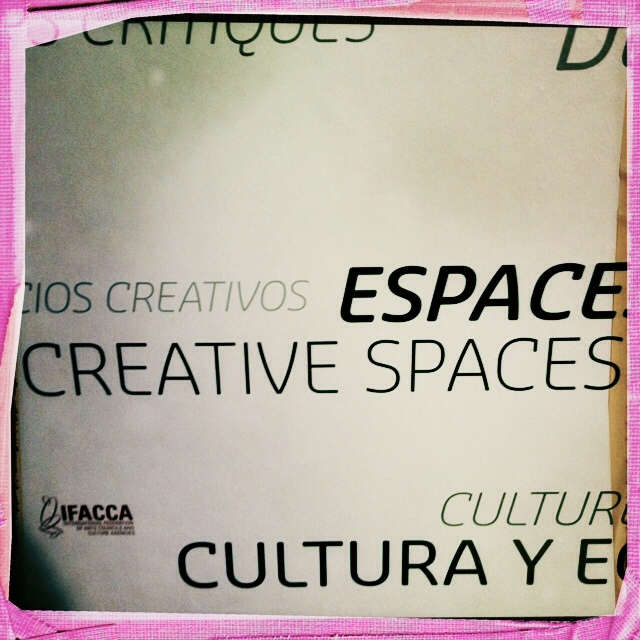 The 3-day event - organised by the International Federation of Arts Councils and Culture Agencies (IFACCA) and the National Council for Culture & the Arts, Chile - brought together over 400 policymakers, artists and cultural professionals from around the world to explore how “the arts and culture can transform the possibilities of development in the dynamic world we live”. We live in a critical time of contradiction, in a contemporary flux. This timely reminder came from Sonia Montecino, one of Latin America’s leading intellectuals, in the very first key note address of Summit. This century is, without doubt, an age of unbridled technology, development and commerce. Unsurprisingly, therefore, the triad emerged as leitmotifs across many panels and sessions of the Summit. How much technology should we let into our lives? The intersection of technology, human interaction and creative expression was a key point of debate. In a special video message, Chinese artist Ai Weiwei hailed modern communication technologies as the most important human creation of all time. They provide invaluable opportunities to access knowledge, build partnerships and liberate ourselves, he said. Google's Hayes Raffle argued that new languages and paradigms are best learnt from children, through play or via cutting-edge technology. On the other hand, Spain’s Angel Mestres called for a return to making face-to-face connections in the physical world. What we lack today is conversation, he said, urging us all to huddle more often at the coffee machine. Musician Manuel Obregon, who is also Costa Rica’s Culture Minister, concurred. His message: let’s begin to invest in people over material things. In the last decade, culture has come to be acknowledged as a driver and an enabler of sustainable development. Texts such as the 2005 UNESCO Convention on the Protection and Promotion of the Diversity of Cultural Expressions and the Hangzhou Declaration (2013) are setting a new tone and asserting the value of culture within a cultural or creative economy. Culture is now included as one of the Millennium Development Goals in the post- 2015 development agenda. In the face of this growing validation of the role and value of culture, two very interesting questions were raised at the Summit. Does culture take an active or reactive role in the social, political and environmental crises of our times, enquired Chile’s Minister President of the National Council for Culture & the Arts, Roberto Ampuero. Recognising that culture may sometimes be an impediment to development (as evidenced in the African context), Mike van Graan of the African Arts Institute wondered what the relationship between culture and social justice is. Does the focus on the value of the creative economy take away from the arts, asked South Africa’s Avril Joffe. She argued that the market is an inadequate guardian for the arts because people have collective needs and identities that the market simply cannot fulfil. “We are all not either sellers or buyers. We have other identities,” she concluded. The discussions around market and meaning often echoed Charles Landry in Culture at the Crossroads: the market economy does not intrinsically invite an exploration of higher purpose and goals. Culture, on the other hand, does. The need of the hour is to recognise this difference and flip our world view from an economy-centred to a culture-centred one, exhorted Arjo Klamer of Erasmus University, Rotterdam. Building on this idea, New Zealand’s Elisabeth Vaneveld called for the creation of a new language for the arts that moved away from market terms such as 'sector' & 'industry'. In critical times, what is the role of culture? The role of culture is to humanise and regenerate us in a noisy, mercantile and technologically-saturated world, said Chile’s Ampuero opening the Summit on 13 January 2014. Built around the overarching theme, Creative Times: New Models for Cultural Development, the Summit explored in depth the changing role of the arts in education, knowledge transfer, innovation, healing & creative convergence. Do not separate culture from education. This was the warning call from the Costa Rican Culture Minister. Sonia Montecino lamented the growing devaluation of arts and humanities and highlighted the increasing contradictions between the formal education system and home cultures. The importance of cultural activities and alternative educational opportunities at the community level were strongly emphasised in the discussion on community leadership. The past surfaced in myriad forms across various sessions: the importance of post-disaster heritage protection; the need for spaces of contemplation in the reconstruction of memory in post-conflict societies; and, the value of simultaneously honouring the past and developing the future. The problem of inequality was introduced into the cultural diversity agenda. As one speaker eloquently put it, we have left out some people from the table of abundance. The significance of networks, cultural centres and inter-sectoral partnerships for social innovation in the nonprofit sector were driven home through a variety of good practices. Open and porous platforms were recognised as critical to broaden traditional spaces for arts presentation and new forms of dialogue with audiences and the larger public. The complexities of cultural leadership – passionately undertaken by artists, collectives, curators and arts managers - in these critical times were shared. The changing nature of cultural policy making in critical times emerged as a key topic across the three days of the Summit. The alarming cuts to public arts funding (and reassessments of the subsidy model) in the wake of the global recession were discussed, leaving some participants wondering why governments were keen to save financial institutions, such as banks, in tough times at the cost of social programmes. Egypt’s Mohammed el Sawy reiterated that culture continues to be seen as a luxury by governments and thus ineligible for priority funding. The new trend of public-private partnerships in arts and culture was explored by Singapore’s Kathy Lai and UK’s Beatriz Garcia. The rise of cities as centres of thinking and decision making in cultural politics was widely recognised by speakers. The role of arts and culture in making cities creative, inclusive and sustainable was explored. In all, the search was for both a greater voice for culture in contemporary times and deeper inspiration to build a more cohesive cultural ecology, which is both creative and sustainable. The next World Summit on Arts and Culture will take place in October 2016 in Valletta, Malta and will be hosted by the Malta Council for Culture and the Arts. Previous World Summits on Arts and Culture have been held in Ottawa, Canada (2000), Singapore (2003), Newcastle Gateshead, England (2006), Johannesburg, South Africa (2009) and Melbourne Australia (2011).